In Plugshare’s recently released quarterly report (Q3 2015), we came across this graphic showing Tesla’s public charging stations in the U.S.
As of September 2015, Tesla has 224 Superchargers (sites, not individual stalls) and a shocking 1,122 destination chargers installed. Meanwhile, CCS still lags far behind the fast-charge leaders. 37 Comments on "Plugshare: U.S Home To 224 Superchargers & 1,122 Tesla Destination Chargers"
One thing that stands out from looking at the maps is that only the superchargers are installed with a view to enabling long distance travel. The CHAdeMO and CCS maps demonstrate quite clearly that they are being installed where they can be, with little or no thought as to whether they will allow cars that require them to “break out” of their home area. Also many CHAdeMO and CCS don’t work or if they do they are much lower kW than expected. Only Tesla is FREE and reliable. Tesla is also more than twice as fast as any others. I’ll be turning in my SOUL EV and Focus EV for a Tesla Model 3 as soon as they are available. I’m ready to order in March 2016 when they open orders. And that is the difference Jim. I too am waiting to see the Model III in March. My Leaf lease is up in April and it goes back. I WANT MY MODEL III. You mean 4-5 years later. Tesla might deliver 10 founders edition a year earlier. He meant 2 years from now. Yes, the advantage of Tesla’s nation-wide (or continent-wide, if you include Europe) strategy for locating chargers for long-distance travel, as opposed to the patchwork of State and local governments and businesses installing them. But realistically, I think we EV advocates should focus first on getting the various EV makers to agree on an actual charging standard, and worry about a national intercity charging infrastructure after that issue is settled. The charging standard needs to be forward-looking, with planning in place for enabling charging in only 5-10 minutes. As it is, most of the existing charge points will quickly become obsolete as BEV ranges increase and BEVs are engineered to accept faster and faster charging. The shop manual for my 2016 Kia Soul EV+ shows that the CHAdeMO charging can handle 500V at 200A so already DCFC is only half the rate mu car can take. There are Superchargers missing from Southern California. I don’t know just what their criteria are for including them. The Supercharger map appears to be missing dots everywhere there would be multiple sites overlapping. To get these to appear, you need to first zoom into these areas and get them to load, then zoom back out. Good point. This is what the map really looks like and matches supercharger.info. On the CCS map, there is an icon of a house. Does someone actually have a CCS charger installed in their home they are sharing w/the public? How about a partnership w/someone like McDonalds. Put 5 CCS chargers at all participating McDonalds nationwide. GM gets their chargers, McDonalds gets green credit and more customers. That would be revolutionary. McDonald’s is a dencent choice because they are everywhere, and many of them have a McCafe which is perfect for a 20 minute pit stop. But what are the chances that this would happen? I’d say pretty low. I have L2 charged at a McDonalds. And it was a red & yellow McDonald’s brand charger, if that makes sense. Very cool. So there is hope. But there is a large gap between a smattering of L2 chargers and having 5 CCS chargers at every location. Something like Starbucks may be more appropriate for the customer base. Yeah, but how many freestanding starbucks still exist? Around here, they are either in a mall or Target. McDonald’s is everywhere. Regardless, some sort of retail partnership would truly be revolutionary. They could even go a step farther and put advertisements on the access screen, generating even more revenue. Anything to help pay for the chargers would help. Most Starbucks along highways are stand-alone drive-thrus . I’ve recommended these types of partnerships before on several forums, but the idea has not got much traction. I believe for 2 reasons: Traditional manufacturers are bone headed and highway restaurant cafes/ restaurants don’t have a low carbon strategy. What we need are federal incentives for highway installations, but that is a tough sell. Most MCD have around 140 kw spare. So just enough for 5-25 kw (output, 140 kw input) charger docking stations. Unfortunately, of the Level 2 installations I have seen, most establishments don’t try to do the most cost effective thing. They simply throw all kinds of money at the problem and end up with something barely useful, such as the ROCHESTER, NY (Irondequoit) I-Square installation of four, 2.9 kw level 2 charger docking stations. Which were brand (2015) new. The MINIMUM people have in their homes is usually 3.6 kw and its usually much bigger. And they don’t spend as much per kw capacity either. Going forward, we should be installing DCFC installations that can power the next gen of EVs that might actually be used for longer trips. 50kW is marginally acceptable for long trips, but maybe okay if co-located at a restaurant. 25kW would be too slow. A one-hour stop at McDonalds getting you only 80 miles of range? No thanks! Better to put in fewer faster stations, in my opinion. Or maybe even 5 50kW units and limit power output as needed if they’re actually all in use and all trying to put out max power at the same time. Meanwhile , GM is focused on not allowing Tesla to sell in Michigan and in other states if they can (what they tried in Maryland). Personally I quite like the Bolt but because GM is acting clearly just like some bullies , this , for me, is one big reason to wait for the 3. Are Canadian sites lumped into these numbers? We might have a whopping 10 or 12 Superchargers by now. Canada has 15 Supercharger sites, 33 CCS sites, and 50 CHAdeMO. Data from Plugshare. It’s clear from the maps and my experience that only Tesla is locating their fast chargers in a strategic manner. ChadeMO and CCS installations are haphazard at best. With the exception of the I5 in Oregon and Washington, most are in and around large metro areas. They aren’t positioned to allow for regional travel except by occasional chance, and certainly not with longer distance travel in mind. The California Energy Commission has shown grants being funded or plans to install fast chargers on the 99 and I5 corridors at various different locations over the past couple of years, but I’m still waiting for the things to actually be built. It’s ridiculous. Meanwhile, Tesla is light years ahead. I agree. There is are basically no non Tesla DCFC of any type between large cities. So even with a 200 mile EV you would have a very difficult time traveling between Northern and Southern California (California being a state where there are probably more chargers than any other state) Who besides, Tesla is willing to place DCFC’s in remote areas? Now if VW and BMW go through with their promise to install DCFC’s then things will look a lot better. But I have yet to see a single new VW BMW DCFC in Northern California. Well I’ll be.. Stevens Creek Bmw in Santa Clara just showed up with a 24kw dcfc. On plugshare Hopefully, others will follow suit. Why would DCFC infrastructure supporting long-distance travel be established years before 200-mile EVs are available? The current 50kW stations are deployed in a way that supports the EVs that are on the market and how they’re used – predominantly around town, with only a few adventurous early adopters actually taking longer trips. All that said, I do agree that GM should be pro-active in getting infrastructure in the ground that’ll help them sell the Bolt. There’s still time (Bolt not going on sale for about a year), and Tesla showed everyone how quickly they can deploy a fast charging network, but I am skeptical that GM will attack this with nearly as much energy. 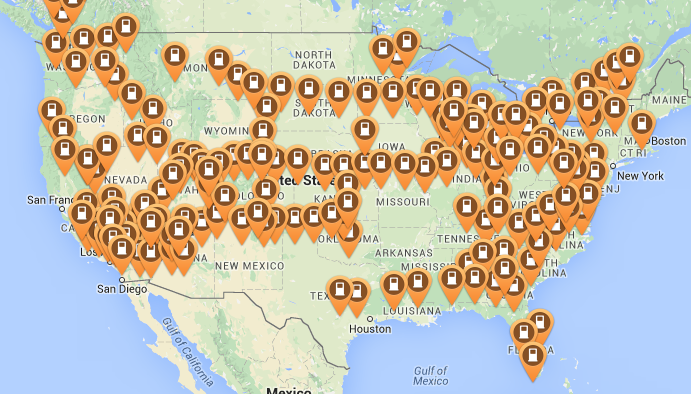 At an average of 5 stalls per Supercharger site, that’s about 1120 Supercharger stalls. So according to this article, Tesla destination charge points now about equal the number of Supercharger charge points. That’s surprising, or “shocking” as the article puts it; I had no idea Tesla was installing them that fast. Since Tesla cars are built with long distance in mind I can see the logic of having strategically placed superchargers. ChadeMO and CCS aren’t being rolled out by one single company hence the mess of installs. In MD where I live the new DCFCs are both ChadeMO and CCS installed at Royal Farms gas stations, which to me makes great sense and provides a great place to stop for 15-20 minutes. I agree with many here that we need to have a single national charging standard.